Ringstrasse cocktail "Sound of the Ring"
To mark the anniversary of the Ringstrasse, Schlumberger, the Vienna Bar Community and the Vienna Tourist Board announced a cocktail competition. The winner: "Sound of the Ring" by Kan Zuo. Twenty-six barkeepers participated in the competition to "capture" the Ringstrasse anniversary in a cocktail. The conditions for participation were a good story about the cocktail and the Vienna Ringstrasse, a suitable name, and Schlumberger Sparkling Brut as an ingredient of the drink. The high-ranking jury chose "Sound of the Ring" by Kan Zuo as the most creative cocktail. Kan Zuo was born in China and the proprietor of "The Sign Lounge Bar" at Liechtensteinstrasse 104-106 in Vienna�s 9th district. He took his inspiration for the cocktail from the impressions he had when he first arrived in Vienna sixteen years ago. 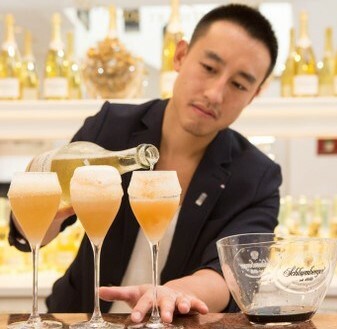 "I wanted to create a golden drink that reflects the noble atmosphere of the Ring," says Kan Zuo. With his creation, he makes reference to Viennese coffee house culture, combining this with the refined bubbling of Viennese sparkling wine and the exotic freshness of the citrus fruit called calamansi, which stands for internationality. Shake the ingredients together - except for the Sparkling Brut - and then top up with Schlumberger. Decoration: Dip the rim of the glass in Galliano Ristretto and then in sugar. I was inspired to create this drink by the fact that 150 years ago, today�s Ringstrasse was still the site of Vienna�s city walls, which had stood for centuries. The city walls gave way to a ceremonial avenue that above all reflects the noblesse of Vienna in the 19th century and the imperial greatness of the Austro-Hungarian monarchy. A symbol of the road are the refined coffee houses, which represent an important aspect of Viennese hospitality. Nowadays, first-time visitors to Vienna are still impressed by the splendor of the area. When I arrived in Vienna sixteen years ago, I was personally very impressed by the Konzerthaus, which isn�t far from the Ring. I therefore wanted to create a golden drink that reflects the noble atmosphere of the Ring. The coffee sugar walls stand for the change that the area has lived through, from defensive installation to cozy meeting place. The calamansi balsamic vinegar represents the international nature of the city, because although it is exotic, it can still be found in well-stocked specialist retailers. In terms of flavor, the "Sound of the Ring" is a composition that could hardly be nobler: Chocolate and coffee combined with the exotic freshness of the calamansi and the noble bubbling of Viennese sparkling wine culture. - Enjoy this drink in an outdoor dining area or at a bar on the Ringstrasse and listen to the "Sound of the Ring". 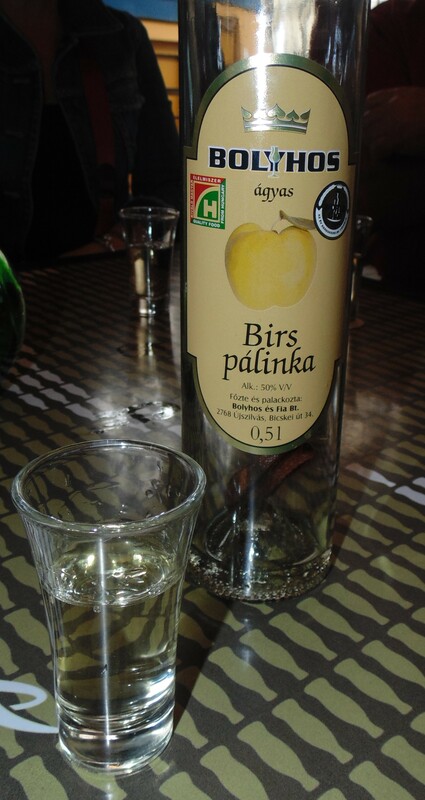 PALINKA . . . CUSTOM OR CURE? P�linka has a special status since it�s the #1 Hungarikum (a unique Hungarian product or cultural artefact) and protected by law. Only fruit spirits (the most common ones are plums, apricots, pears, apples and sour-cherries) distilled and bottled in Hungary can be called p�linka. Back in the 1990s there was even a legal dispute between Romania and Hungary about the use of name since the drink is also considered a Romanian product under the name pălincă. According to legend the winning argument in favour of Hungary was the Romanian etymological dictionary which defined pălincă as �fruit distillate of Hungarian origin�. Actually, the Hungarian version is a loan word from the Slovak �palenka� which is derived from the verb palit� meaning �to burn�. Most Americans traveling in Hungary experience this grappa like liqueur as an after dinner drink, usually at the urging of locals and fellow travelers. It is considered something to be savored when on vacation to the city of Budapest. Most Hungarians have an uncritical faith in the fact that p�linka is a general remedy for all pain and sorrow. The habit of starting the day with a shot of p�linka, is expressed in the language by the humorous wish of �Palinkas Jo Reggelt'. The tradition goes back to the times when peasants doing hard work in the field had a shot as an appetizer. The reflection of this is the word Arato Palinka, the �p�linka for harvest�, in its best strength it is a brandy of 53% alcohol content. If you visit a home (especially in the country) be prepared to be greeted by a shot, very often the host�s own distillate. The presentation of the drink can be quite ceremonial, first smelling it, then a sip and then knocking back the whole shot. Always praise it by saying Finom, Remek or ten more synonyms of delicious. The host is expected to offer more if he/she sees you like it. If you don�t want more, say K�sz�n�m, nem (thank you no), or tal�n k�sőbb (perhaps later).